Pena Dura had it all: mad scientists, tough soldiers, plot twists and an upcoming villain. It also had some questionable performances, predictable plot twists and cringe-worthy moments. After the attempted execution of Victor Zsasz we find Penguin (Robin Lord Taylor) and Captain Jim Gordon (Ben McKenzie) at odds. Gordon and his partner Harvey Bullock (Donal Logue) are determined to find who really did do the Haven bombing, and they find unlikely help in a new commando force that entered Gotham. This force is led by Eduardo Dorrence (Shane West), a former trooper who was with Gordon in the Army. Eduardo, all gravelly-voiced in an apparent effort to out gravel Gordon, is taking charge and taking names to find the bomber. It's only a matter of time before we all discover that the Haven attacker was Edward Nygma (Cory Michael Smith). Nygma, however, would not willingly kill innocents. He is convinced that he is being controlled and knows that his frenemy Penguin (Robin Lord Taylor) knows something. Nygma has a price on his head and works furiously to avoid getting caught. After a brief encounter with some country hicks, he makes his way to Pengy, who points him to Dr. Hugo Strange (B.D. Wong). 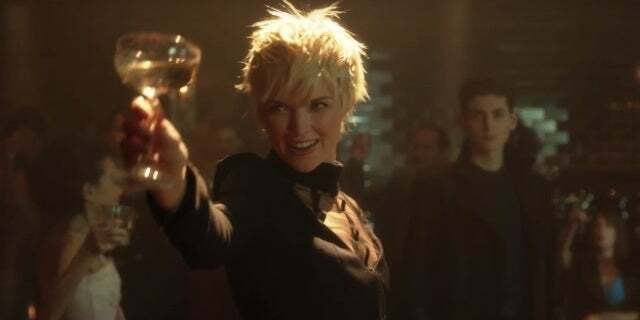 Penguin is not above selling Nygma out, but Nygma escapes again only to be caught by Barbara Kean's (Erin Richards) minions. She doesn't quite believe Nygma's being controlled, but has enough doubt to send him to Strange. 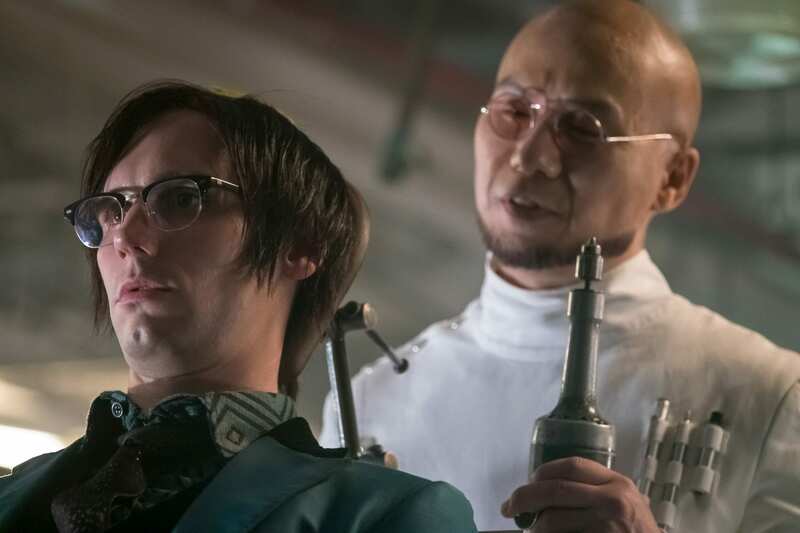 We discover that Strange did indeed implant a chip to control Nygma under orders. Who gave those orders? Those in charge of Eduardo, who was sent in as part of some Reichstag Fire-type plan to retake Gotham. Gordon, always moral, will not kill Nygma and manages to escape Eduardo's hit-squad. Now Eduardo orders Nygma to find and exterminate Gordon. In a minor plot, we find that Jeremiah Valeska (Dominic Monaghan) is very much alive and has created some beings, speaking cryptically of 'loving a family reunion'. Bruce Wayne (David Mazouz) is worried about his own frenemy Selina Kyle (Camren Bicondova), who is the toast of Gotham for having 'killed' Jeremiah. Just about everything in Pena Dura is either predictable or unbelievable. There is the embarrassing hillbilly encounter that Edward endures, starting out with the hillbilly stereotypes. One wonders where exactly these hicks came from in such an urban jungle as Gotham. The nadir of this bit is when Nygma echoes Brer Rabbit's plea not to be thrown in the brier patch when he's being tortured. I could see where that was going a mile away. I can also see where the 'family reunion' is going, and I think if Jeremiah really did create a version of George and Martha Wayne as some kind of psychological torture for Bruce then Gotham really has broken any sense of credibility. It cannot be that obvious. I see that Gotham last time echoed Memento and now is echoing more tropes like the implanted chip. There's even a scene between Penguin and Bullock/Eduardo where you expect Pengy to shout, "SAY HELLO TO MY LITTLE FRIEND!" I cannot muster shock at the thought that a voice is instigating a lot of the craziness. I cannot muster enthusiasm for a lot of the acting either. Bless Wong, who has embraced the sheer camp of Dr. Strange. He is so delightfully droll as our mad scientist it makes Gotham into a comedy. I grant some leeway in that I figure this is how Strange is supposed to be. I cannot say that for everyone else. I have faint memories of Shane West only as "Agent (Tom) Sawyer" from League of Extraordinary Gentlemen. What was meant as a breakout/heartthrob/action star role was a major part of the fiasco that was League of Extraordinary Gentlemen. I know it is unfair to hold that horror against him, but for the life of me I cannot see Shane West as the future Bane. Granted, it's too soon to dismiss him, but so far I'm not convinced, and if Eduardo Dorrence is meant to be Hispanic then we have issues here. I also found his efforts at a 'gravelly' and/or menacing voice were slightly amusing more than intense. Even the normally reliable teaming of RLT and CMS failed to be good. Their scene fell flat with me and it was the first time I felt I was watching them act versus watching them be. Smith felt weak in this episode, as if things were growing too outlandish even for his Riddler. I felt the same about Monaghan in his few moments, the campy "not-Joker" bit now pretty stale. Only in their brief scene did Mazouz and Bicondova leave a positive impression. Pena Dura left me cold and uninterested, not so much wondering where things were going but how things are going to get better. As we close out this series, I do hope that it picks up a bit.